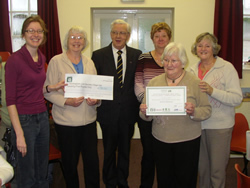 When Beckingham and Saundby Village Hall Management Committee became runners-up in the Bassetlaw section of the 2009 Best Run Village Hall in Nottinghamshire competition they were unable to visit County Hall to collect the cheque and certificate. These were presented in the village on Monday 7th December when Katie Wilson, Village Hall Adviser, and Gordon Asher, Deputy Lieutenant President of NAVACH (Notts. Association of Village and Community Halls), came to the Committees weekly coffee morning. When the competition was last held in 2006, the hall was undergoing major improvements. Three years on the hall has been brought into the 21st century and is popular for many events. The Committee not only manages the Village Hall but also the playing field, play park, tennis court and soon to be completed multi use games area. In accepting the certificate and cheque the Secretary Joan Clifton thanked the Committee members for their work and all the villages for their interest and support.